This entry was posted in News and tagged hatsune miku, nendoroid, snow miku, vocaloid, yuki. I’m not quite pleased with the result. I think the other 3 designs were closer to the contest specifications. I mean…I can see a hint of winter in this design but pastry?? Where?! Ichigo daifuku. It’s a fruit flavored snack. I do like the winning design, but I wanted #1 to win. I’m very happy this design one. The wedding kimono is beautiful. There needs to be more kimono nendoroids! ._. i are dissapoint. i was hoping that the winner would be more winter and sweets themed seeing as how that was the THEME OF THE CONTEST ugh… its cute but it is a little disappointing to me that it has to be the nendoroid for winter miku 2013, im not saying it wont look good but i just wish one of the other had won for this particular miku theme i guess.. when i saw the post on mikatans blog and saw the 4 finalists i was like .. i have a bad feeling the 4 is gonna win.. and it did XD its cute still so congrats to the winner and congrats to the other finalists. hope next years winter miku will look good with my other winter mikus. 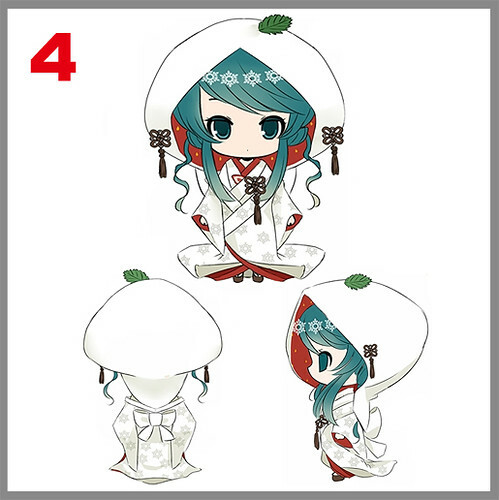 She looks warmer than the other three, kinda resembles a yuki onna and her whole head looks like a Japanese sweet. I think it fits the theme more than well enough. I’m disappointed, it’s not copypaste enough. Why would you want copy/paste though? Why buy something that looks nearly alike to something you already own? The more unique the better I think! It’s Miku! We need more identically looking Miku! MORE! 34 Miku nendos all looking the same isn’t enough! And more Saber. We need more Saber too. Blue… blue… blue… GREEN AND RED. None of my favorites made it into the finals but I’m glad 4 won.It had the most unique design and I’ve always wanted to have a Miku nendoroid with a different hair style.1 was cute,2 was ok but it didn’t really have anything to do with sweets besides being a maid and having a straw in her headset,and 3 looks too much like the winter coat version. Snow maiden miku epic winn! I’m glad that this one won 🙂 Other look too plain. Maybe I will consider getting it. Oh ok, not maybe 😉 I’m more into scale figs than nendos, but this one looks too cool. I’m glad I went and voted, because the final result was so close! 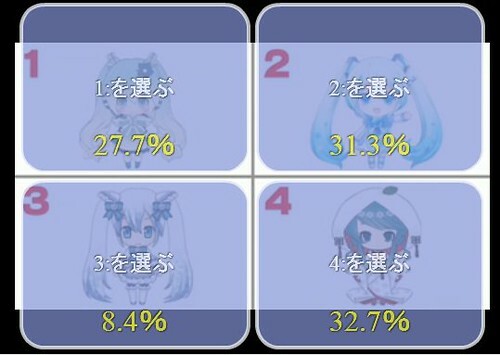 #4 was my favourite, so I’m ecstatic and will definitely be getting her, but I would have been happy if #1 or #3 won as well. #2 just looked too similar to the previous designs for my taste. I wonder what accessories she’ll come with? She still needs her headphones. I want a tiny moon rabbit companion or mound of mochi! Or maybe they could continue the strawberry theme. For me it doesn’t really look like ‘snow’ miku, doesn’t snow miku need to like ‘merge’/ ‘connect’ with snow? I mean, I don’t really like it. But it’s unique let’s just see what will heppen. I love it! It fits the theme but is very cute and creative. I absolutely love the design! I might just get my first Miku when it comes out later. Can’t wait!